There are few things I love more in this world than a quality cup of coffee, as well as a relaxing backcountry camping trip. Once the birds wake me up, I get a fire roaring, wrap myself in a little blanket and wait patiently. Once the water boils, I prepare a good ol’ fashioned cup of Joe and sit by the lake. Only one word can truly describe this moment — bliss. Just because you’re heading out into the wilderness, does not mean you need to leave your favorite coffee mug and grinds behind. 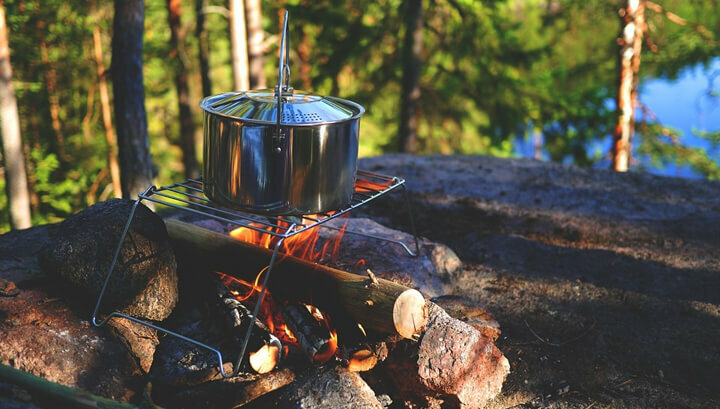 With a range of easy and effective brewing methods, your outdoor experience will instantly become that much more enjoyable. Just because you’re in the great outdoors does not mean you need to sacrifice your favorite part of the morning. Regardless of your location, you should never settle for anything less than a quality cup of coffee. Although you may be after caffeine, quality matters — not only in terms of taste, but also for your health and morality. You may be surprised to know that conventional coffee is heavily exposed to a chemical cocktail of pesticides, herbicides, fertilizers, insecticides and fungicides. In comparison, organic coffee, such as Lucy’s Bru, offers significant health benefits, all while protecting the environment and farm workers. 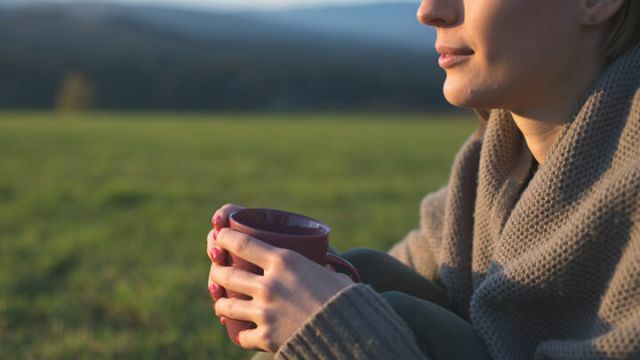 From weight loss support to a reduced risk of diabetes, quality, organic coffee is an incredible health-boosting beverage, but its benefits do not stop there — especially for outdoor enthusiasts. There’s nothing more satisfying than a freshly brewed cup of coffee by the water’s edge. Before you head out on your next adventure, become familiar with these effective brewing methods. While camping, once I open my eyes, after the morning dew on my tent comes into focus, there’s one thing on my mind — it’s time to build a fire. After I collect kindling and get a fire going, I get my pack down from a high branch (little bear safety trick), excitedly reach for my fresh grounds and get ready for a special moment. I generally go camping with a couple of friends or family members, all who generally sleep later than me. That moment in the morning is when I feel totally at peace. I brew a cup of coffee, get out my journal, enjoy the sounds of birds and watch the odd fish jump out of the lake. These are some of my favorite methods — try them for yourself. 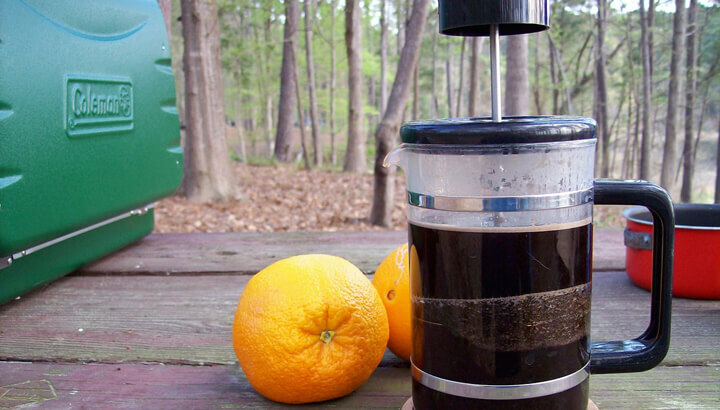 Whether I’m at home or backcountry camping, I adore my little French press. It was my sidekick throughout college, has come on many camping trips with me, and continues to welcome me each morning to this day — tried and true. I drink my coffee black and find that a French press offers a richer, thicker cup of coffee. To make the whole process easier, pre-grind your coffee beans at home. If you fancy an extra fresh cup, you can also bring along a small hand grinder. Place your grinds in the press, adding water just before it reaches its boiling point. Let it hang out for a few minutes, then press down the lid to brew some liquid gold. As an alternative to the French press, I find that this method truly adds to the overall setting, offering a more natural cup of java. Used by populations around the globe, a cup of cowboy coffee is most certainly an American tradition. Producing coffee that is bold and highly flavorful, I can’t help but love this method. Although many think of this method as a last resort, when brewed well and made with quality coffee, you will not believe the end result. There are a couple of ways to tackle this method, but I personally boil water, remove from the fire, add water and coarse grinds to a mug, stir after two minutes of brewing, then allow the grinds to settle — easy peasy. Since I often portage, I try and pack as light as possible. This method is great for a solo cup or a group, as it’s easily scalable. Bring along some coffee filters, grinds and string. All you need to do is scoop the desired amount of coffee and place it in the center of your filter, fold up the sides, then tie it shut. Think of it almost like a tea bag, but instead, you will brew a delicious cup of coffee or two. Once again, bring water to a boil. 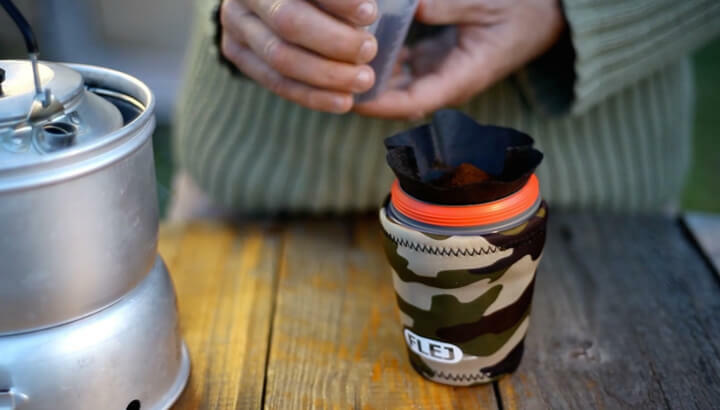 If you’re making a cup for yourself, simply place the ‘bag’ into your mug and pour water directly on top, brew, and discard your DIY coffee pouch. For a group, place into the pot and allow to brew accordingly before dishing it out. While backpacking, nothing beats a reusable coffee filter. This method reminds me of my mom, as her reusable coffee filter was never left behind during family camping adventures. I do like this method because there’s very little waste and it can easily be stored directly inside your mug. Being ultra lightweight, it’s the perfect backpacker’s companion and when it’s time to brew, the process could not be simpler. You can source a variety of styles and brands, so select the option that’s right for you. Simply scoop your grinds into the filter, place into your mug, pour hot water through the filter and allow to steep. If you’re backcountry camping, be sure to bury your discarded grinds. So, the next time you’re packing for your next outdoor adventure, don’t leave your favorite part of the morning behind. You can enjoy a delicious cup of coffee without any fuss. 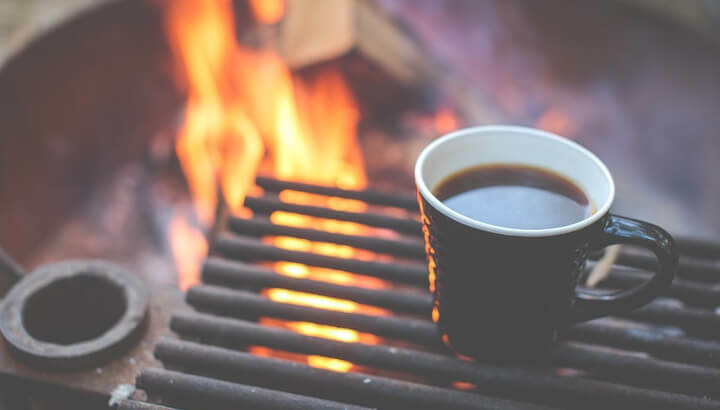 Hey Buddy!, I found this information for you: "4 Ways To Brew Great Coffee Outdoors". Here is the website link: https://www.thealternativedaily.com/4-ways-brew-great-coffee-outdoors/. Thank you.